The town of Harsewinkel sits in the Westphalian countryside on the borders of Muensterland and East Westphalia. 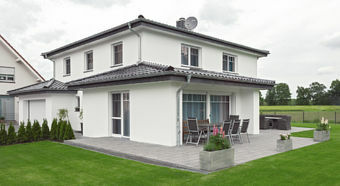 This spacious new build, home to a family of four, is located in its rural Marienfeld district. Completed in early 2015, the 200m2 interior, spacious terrace and surrounding garden provide plenty of space for the entire family. From the outside, it is similar to most of the surrounding homes. Inside, however, the building is packed with impressive smart home automation solutions. In this respect, it certainly has much to offer, starting with remotely controlled lighting and blinds and the energy-efficient heating system. 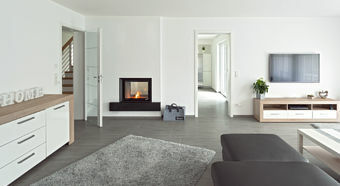 As well as providing a focal point, for example, the wood-burning stove also heats the water for the radiator system and heats and cools the underfloor heating system. Meanwhile, a ventilation system ensures continuous air exchange. 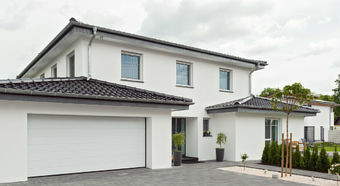 A system which could be used to raise and lower the shutters easily and flexibly by smartphone or tablet and to switch the lights on and off both centrally and individually: That was the brief the owners gave Bernhard Heseker of Elektro Heseker & Kuechentechnik GmbH. And simple though it sounded, the task proved something of a challenge for the master electrician; for at the time, neither the division of space, the positions of the doors nor the fittings to be installed in the various rooms had been decided. One thing soon became clear: Heseker needed to install a system that could be tailored to the individual needs of the family at a later date. 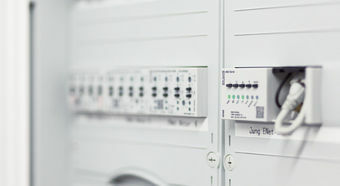 The team at Elektro Heseker found the optimum solution in the form of JUNG’s bi-directional eNet radio system. 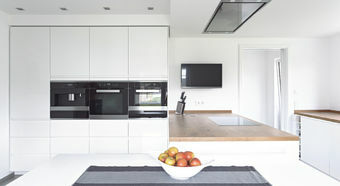 Its flexible design makes it easy to retrofit additional components without having to open up walls and modify wiring. 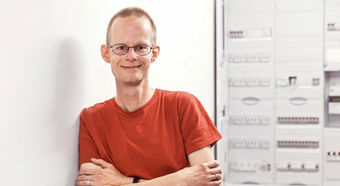 And the result is impressive: According to Heseker, they have already programmed 83 different connections. It can be used to control lighting levels in all the rooms remotely via either the private home network or the 60 or so wall transmitters. Even the exterior and garden lighting can be controlled remotely at the push of a button via eNet. 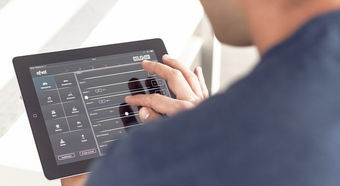 In addition, the exterior lighting can also be controlled manually by means of a switch located next to the front door. The family also has remote access to the cameras fitted outside. For extra security, most of the external lighting can be operated according to a pre-set timetable. Once programmed, it will always go on and off at the desired times. This function can also be controlled via the eNet server which operates as an intelligent control centre. All eNet components can be commissioned, programmed and controlled, and the various systems networked, from the server. The 20 or so blinds on the ground and first floors can also be operated floor by floor by means of switches or all together from the front door on the ground floor. An override function has also been included that can be used to switch the system off centrally. 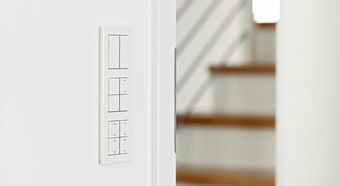 The large push-button switches are simple and easy to operate. For optimum function allocation (blinds, lighting, etc.) 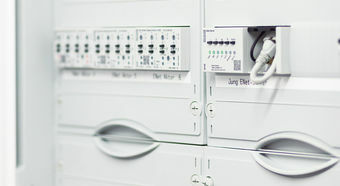 switches can be individually labelled by means of laser engraving or colour printing using JUNG’s graphics tool. 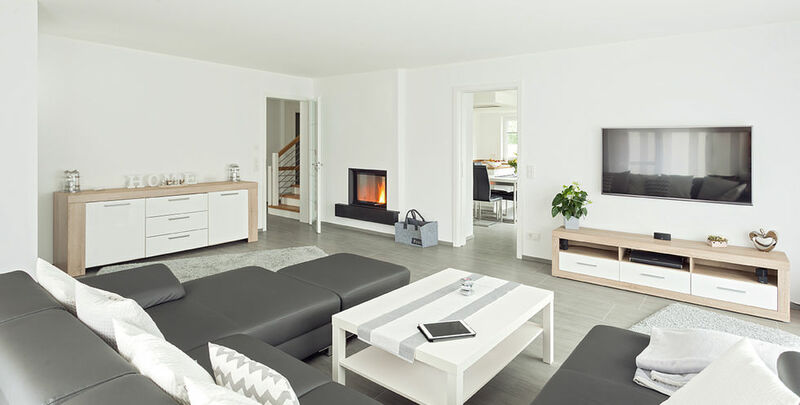 To save energy, the sockets in the living area offer an additional advantage: If necessary, the standby mode on devices, such as televisions, receivers and music systems, can be switched off. 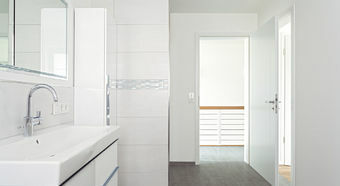 In the living room, spot, ceiling and wall lights can all be dimmed using JUNG’s Universal Dimmer. 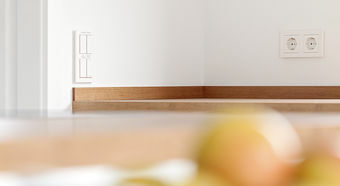 In keeping with the bright, modern decor, all the switches and sockets have been chosen from JUNG’s modern look “A creation” range in pure white, creating a clean, minimalist note. 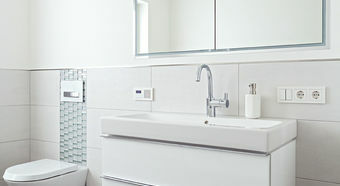 The JUNG Smart Radio with its unique glass front fitted in the bathrooms on the first floor comes from the same “A creation” range, ensuring a harmonious look throughout. And the Smart Radio can be fitted just as easily as a light switch. 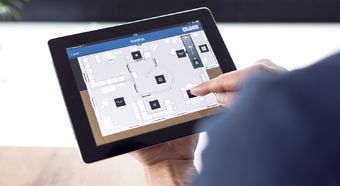 JUNG eNet – the smarter radio-controlled system – will continue to offer optimum expansion capabilities in the future through its free outputs, ensuring that the still uncompleted exterior features can be seamlessly integrated into the system. eNet Wall transmitter Wireless commands for the control of lighting and blinds are transmitted, including scene functions. The operation takes place via large push-buttonswhich are equipped with LEDs for status indication. With the Graphic Tool you can customise buttons with images, symbols and text by means of laser engraving or colour print method. This supports a clear function allocation. Smart Radio The JUNG Smart Radio with its unique glass front fits in with any desired décor with its diverse designs. It is as easy to install as a light switch. 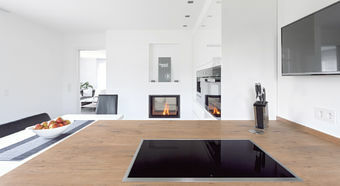 The touch display in black or white ensures ease of operation. A creation – in white The A creation series makes a convincing impression not only through its clear structure but also in its choice of exclusive materials: The frames in pure white have a clear, elegant form.